The first and perhaps most important item in your anti-furniture-scratching arsenal is a proper cat scratching post. Cat posts come in all shapes and sizes; whether you live in a studio apartment or a sprawling mansion, cat posts are available to suit your needs. The post you choose should be stable and large enough for your cat to scratch while her body and limbs are fully extended, fulfilling your cat’s desire for vertical scratching. Take care to ensure the base is secured so the post doesn’t tip over — you want your cat to trust the post and feel safe to scratch it at her leisure. A cat post that wobbles or topples over is a cat post kitty will not use. Veterinarians recommend posts or towers that contain sisal material — a thick, fibrous woven textile fabric that is satisfyingly scratchable for kitties. Even the most finicky cats seem to love digging their claws in and shredding the sisal material. When introducing a post into your home, place it in a room that your family frequents. Your cat is most likely to use a post to mark his territory if it is in an area full of activity. Ask yourself where you and your kitty spend the most time, and then set up a scratching post in that location. Ideally, you should try to have scratching posts in several locations to curb as much of the undesired scratching as possible. Cat-scratch mats are a versatile option for small spaces and can hang from doorknobs. Cat beds made of sisal or corrugated cardboard are great for cats that love to stretch and scratch when they wake up from a nap. Your cat should have only positive associations with the post. Sprinkle some catnip onto the post and let kitty have some fun. Use treats and toys as rewards when she chooses the post over your favorite chair. 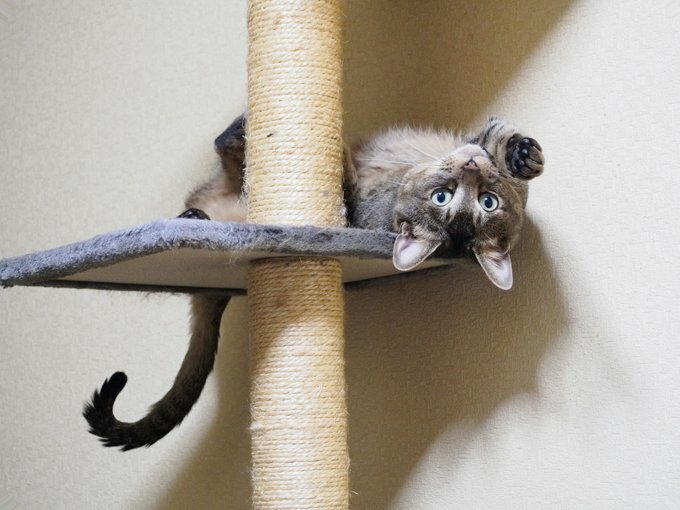 Grab some of your kitty’s favorite toys and drape them over the post to encourage scratching. Eventually, she should get the hint.